What has happened to the Legislation Directory? Cad atá tar éis tarlú don Eolaire Reachtaíochta? Legislative amendments were previously held in a section of the eISB known as the Legislation Directory. The information from the Legislation Directory has now been integrated into relevant parts of the site. For example, to find the list of amendments made to a particular Act, go to that Act and then click on the “Amendments, Commencements, SIs made under this Act” button. Users should note that information is displayed differently in relation to Acts enacted before and after 1972. Each Act enacted before 1 January 1972 appears in a table for the year in which the relevant Act was enacted and Acts appear in order of enactment in that table. Entries include details in relation to how each Act has been amended or otherwise affected. Details in relation to commencement information for Acts enacted prior to 1972 can be found on the Acts home page under Acts-More information, Commencement Orders. There is currently no list available of secondary legislation made under individual Acts enacted before 1 January 1972. Each Act enacted since 1 January 1972 has its own table containing three sub-tables: commencement information, amendments and other effects, and other associated secondary legislation (SIs made under the Act) and effects. Work is continuing to extend this newer format to Acts enacted before 1972. Roimhe seo, coimeádadh leasuithe reachtúla i roinn den eISB dar teideal an tEolaire Reachtaíochta. Anois, tá an fhaisnéis ón Eolaire Reachtaíochta comhtháthaithe i gcodanna ábhartha den suíomh. Mar shampla, chun liosta de na leasuithe a rinneadh ar Acht áirithe a aimsiú, téigh chuig an Acht sin agus cliceáil ar an gcnaipe “Leasuithe, Tosaigh Feidhme, IRí arna ndéanamh faoin Acht seo”. Ba chóir a thabhairt faoi deara go léirítear faisnéis ar bhealach difriúil maidir le hAchtanna a achtaíodh roimh agus tar éis 1972. Léirítear gach Acht a achtaíodh roimh 1 Eanáir 1972 i dtábla don bhliain ar achtaíodh an tAcht ábhartha agus léirítear Achtanna in ord achtaithe sa tábla sin. Áirítear sonraí maidir leis an leasú nó tionchar eile a bhí ar gach Acht sna hiontrálacha. Is féidir teacht ar shonraí maidir le faisnéis tosaigh feidhme d’Achtanna a achtaíodh roimh 1972 ar leathanach baile na nAchtanna faoi Achtanna-Tuilleadh Faisnéise, Orduithe um Thosach Feidhme. Faoi láthair, níl liosta den reachtaíocht thánaisteach a rinneadh faoi Achtanna aonair a achtaíodh roimh 1 Eanáir 1972 ar fáil. Tá a thábla féin ag gach Acht a achtaíodh ó 1 Eanáir 1972 ina bhfuil trí fhothábla: faisnéis tosaigh feidhme, leasuithe agus tionchair eile, agus reachtaíocht thánaisteach eile (IRí arna ndéanamh faoin Acht) agus tionchair lena mbaineann. Tá obair ag dul ar aghaidh chun an fhormáid nua seo a shíneadh go hAchtanna a achtaíodh roimh 1972. See How will I know if a piece of legislation has been amended? Féach ar Conas is eol dom má rinneadh leasú ar phíosa reachtaíochta? What’s on this site? Cad atá ar an suíomh seo? What can I find on the eISB?Cad is féidir liom a aimsiú ar eISB? The eISB includes all Acts of the Oireachtas from 1922 to the present, statutory rules and orders from 1922 to 1947, and statutory instruments from 1948 to the present. It also includes most of the pre 1922 public and general statutes still in force in the State following the enactment of the Statute Law Revision Act 2007 (the Act of 2007). The Act of 2007 repealed all public and general statutes enacted before 6 December 1922 with the exception of those listed in Schedule 1 of that Act. In the case of a small number of those statutes, the full text is not available in electronic format. The text of the Constitution of Ireland is also published on the site. The site has further information about legislation, including a list of collective citations, a list of commencement orders, a list of Orders made under section 6(1) of the Ministers and Secretaries (Amendment) Act 1939 and a list of Regulations made under section 3 of the European Communities Act 1972. Áirítear ar an eISB gach Acht an Oireachtais ó 1922 go dtí an lá inniu, rialacha agus orduithe reachtúla ó 1922 go 1947 agus ionstraimí reachtúla ó 1948 go dtí an lá inniu. Áirítear freisin formhór na reachtanna poiblí agus ginearálta réamh-1922 atá fós i bhfeidhm sa Stát i ndiaidh achtú an Achta um Athchóiriú an Dlí Reachtúil 2007 (Acht 2007). D’aisghair Acht 2007 gach reacht poiblí agus ginearálta a achtaíodh roimh 6 Nollaig 1922, seachas iad siúd a liostaítear i Sceideal 1 den Acht sin. I gcás líon beag de na reachtanna sin, níl an téacs iomlán ar fáil san fhormáid leictreonach. Tá téacs Bhunreacht na hÉireann foilsithe ar an suíomh freisin. Tá faisnéis bhreise faoin reachtaíocht ar an suíomh, lena n-áirítear liosta de chomhluanna, liosta d’orduithe um thosach feidhme, liosta d’Orduithe arna ndéanamh faoi alt 6(1) den Acht Airí agus Rúnaithe (Leasú) 1939 agus liosta de Rialacháin arna ndéanamh faoi alt 3 d’Acht na gComhphobal Eorpach 1972. Will I find new legislation on the eISB?An bhfaighidh mé reachtaíocht nua ar an eISB? New Acts and statutory instruments are published as soon as possible after they have been notified in the Iris Oifigiúil and we have received them from the Houses of the Oireachtas and Government Publications. The homepage of the eISB contains information about the legislation most recently published in PDF format. Foilsítear Achtanna agus ionstraimí reachtúla nua chomh luath agus is féidir tar éis fógra a thabhairt dóibh san Iris Oifigiúil agus iad faighte againn ó Thithe an Oireachtais agus Foilseacháin Rialtais. Tá faisnéis faoin reachtaíocht is déanaí a foilsíodh i bhformáid PDF ar leathanach baile an eISB. Why is the legislation I’m looking for not on this site? Cén fáth nach bhfuil an reachtaíocht a theastaíonn uaim ar an suíomh seo? Some legislation dating from before 1922 is not published on the site because it has either been repealed or is not available in electronic format. Very recent Acts or statutory instruments may not yet have been published (see answer to previous question). Níl roinnt reachtaíochta ón tréimhse roimh 1922 foilsithe ar an suíomh mar aisghaireadh é nó níl sé le fáil i bhformáid leictreonach. Seans nach bhfuil Achtanna ná ionstraimí reachtúla an-nua foilsithe go fóill (féach ar an bhfreagra ar an gceist roimhe seo). Is the legislation on this site the official version? An é an leagan oifigiúil é an reachtaíocht ar an suíomh seo? No, the electronic version is not the official version. Article 25.3.5 of the Constitution provides that the text of an Act which is signed by the President and enrolled in the office of the Registrar of the Supreme Court shall be conclusive evidence of the provisions of such law. Section 2 of the Documentary Evidence Act 1925 provides that prima facie evidence of an Act may be given in all Courts of Justice and in all legal proceedings by producing a paper copy published by Stationery Office. Section 3 of that Act contains a similar provision in relation to statutory instruments. Ní hé. Ní hé an leagan leictreonach an leagan oifigiúil. Déanann airteagal 25.3.5 den Bhunreacht foráil gurb é téacs Achta a chuireann an tUachtarán a lámh leis agus atá rollaithe in oifig an Chláraitheora den Chúirt Uachtarach fianaise dhochloíte fhorálacha an dlí. Déanann alt 2 den Acht um Fhianaise Scríbhinne 1925 foráil gurbh fhéidir fianaise prima facie d’Acht a thabhairt i ngach Cúirt Bhreithiúnais agus i ngach imeacht dlíthiúil trí chóip páipéir a foilsíodh ag Oifig an tSoláthair a thabhairt ar láimh. Tá foráil den sórt céanna in alt 3 den Acht sin maidir le hionstraimí reachtúla. Where can I buy a paper copy of an Act or statutory instrument? Cá bhféadaim cóip páipéir d’Acht nó d’ionstraim reachtúil a cheannach? To buy paper copies of legislation, you can contact the Government Publications Office. Chun cóipeanna páipéir de reachtaíocht a cheannach, is féidir dul i dteagmháil le hOifig Foilseacháin an Rialtais. Where can I find a Bill? Cá bhféadaim teacht ar Bhille? You can find Bills and information on amendments to Bills on the Houses of the Oireachtas website. Is féidir Billí agus faisnéis faoi leasuithe ar Bhillí a aimsiú ar shuíomh gréasáin Thithe an Oireachtais. How will I know if a piece of legislation has been amended? Conas is eol dom má rinneadh leasú ar phíosa reachtaíochta? The first step is to locate the relevant piece of legislation: Act or statutory instrument. At the top of the text of the Act or Statutory Instrument, you will see a box marked (in the case of Acts) “Amendments, Commencements, SIs made under Act” or (in the case of statutory instruments) “Amendments”. Click on this box to access amendment information. In the case of statutory instruments, you should be aware that only amendments made between 1 January 1972 up to the most recent date set out at the top of the relevant page are recorded. Amendments made on or after 1 January 1972 to pre 1972 statutory instruments are listed, but not amendments to such statutory instruments made before 1972. For example, all amendments made since 1 January 1972 to the Solicitors' Accounts Regulations 1967 (S.I. No. 44 of 1967) are listed, but any amendments made between the date on which those regulations were made (2 March 1967) and 31 December 1971 are not currently listed. An chéad chéim ná an píosa ábhartha reachtaíochta a aimsiú: Acht nó ionstraim reachtúil. Ag barr théacs an Achta nó na hIonstraime Reachtúla, feicfidh tú bosca marcáilte (i gcás Achtanna) “Leasuithe, Tosaigh Feidhme, IRí arna ndéanamh faoin Acht” nó (i gcás ionstraimí reachtúla) “Leasuithe”. Cliceáil ar an mbosca seo chun faisnéis faoi leasuithe a aimsiú. How do I find out if an Act has come into operation? Conas a fhaighim amach má tá Acht i bhfeidhm? If there is no information regarding commencement, the Act came into force on the date on which it was passed by the Oireachtas. This date can be found under the long title of the Act. Sometimes a provision or provisions of an Act states that a commencement order is required to bring all or part of an Act into effect (e.g. "This Act shall come into operation on such day or days as the Minister may appoint by order..."). The eISB includes a list of commencement orders listed by Act. To find commencement orders that have been made since the last update to the commencement order list, you can check the statutory instruments on the eISB made since the last update. Díreach cliceáil ar an gcnaipe ag barr an Achta marcáilte “Leasuithe, Tosaigh Feidhme, IRí arna ndéanamh faoi Acht”. Leagtar amach an fhaisnéis ábhartha um thosach feidhme don Acht sa tábla dar teideal “tosach feidhme”. Mura bhfuil aon fhaisnéis maidir le tosach feidhme, tháinig an tAcht i bhfeidhm ar an dáta ar ritheadh é ag an Oireachtas. Is féidir teacht ar an dáta seo faoi theideal fada an Achta. Uaireanta deir foráil nó forálacha Achta go dteastaíonn ordú um thosach feidhme chun Acht iomlán nó cuid de a thabhairt i bhfeidhm (m.sh. \“Tiocfaidh an tAcht seo i ngníomh cibé lá nó laethanta a cheapfaidh an tAire le hordú...\”). Áirítear ar an eISB liosta d’orduithe um thosach feidhme atá liostaithe de réir Achta. Chun teacht ar orduithe um thosach feidhme arna ndéanamh ón nuashonrú deireanach ar an liosta orduithe um thosach feidhme, is féidir na hionstraimí reachtúla ar an eISB a rinneadh ón nuashonrú deireanach a sheiceáil. Where can I find the text of an Act with the amendments included (Revised Act)? Cárbh fhéidir liom teacht ar théacs Achta leis na leasuithe iniata (Acht Athbhreithnithe)? Where a Revised Act has been prepared by the Law Reform Commission there is now a direct link from the Act on the eISB, from a tab at the top of the individual Act page, to the Revised Act on the Commission's web site. When viewing an Act by section there is also a direct link to the corresponding section of the Revised Act. I gcás go bhfuil Acht Athbhreithnithe ullmhaithe ag an gCoimisiún um Athchóiriú an Dlí, tá nasc díreach nua anois ón Acht ar an eISB ón táb ag barr an leathanaigh aonair Achta leis an Acht Athbhreithnithe ar shuíomh gréasáin an Choimisiúin. Agus tú ag féachaint ar Acht de réir ailt, tá nasc díreach leis an alt comhfhreagrach den Acht Athbhreithnithe anois freisin. How often is the amendment and commencement information updated? Cé chomh minic is a nuashonraítear an fhaisnéis leasaithe agus tosaigh feidhme? In general, tables of amendments, commencements and SIs made under Acts are updated every 4-8 weeks, subject to the availability of new legislation. You can find the current date up to which the tables are updated on each relevant page. Go ginearálta, nuashonraítear táblaí leasuithe, tosach feidhme agus IRí gach 4-8 seachtaine, faoi réir infhaighteacht na reachtaíochta nua. Is féidir teacht ar an dáta a ndearnadh nuashonrú ar na táblaí ar gach leathanach ábhartha. Who produces amendment information and revised Acts? Cé a chuireann faisnéis faoi leasuithe ar Achtanna athbhreithnithe i láthair? They are produced by the Law Reform Commission. Cuirtear i láthair iad ag an gCoimisiún um Athchóiriú an Dlí. I don’t understand how to read the abbreviations in the tables of amendments: where can I find out what they mean? Ní thuigim conas na giorrúcháin sna táblaí leasuithe a léamh: cárbh fhéidir liom fáil amach cad is brí leo? You can visit the glossary. Is féidir cuairt a thabhairt ar an ngluais. Is all legislation on the eISB searchable? An bhfuil an reachtaíocht ar fad ar an eISB inchuardaithe? Only hyperlinked versions (HTML versions) of legislation are searchable from the quick search and advanced search page of the eISB. While PDF versions of SIs and Acts are published on the eISB as soon as possible, corresponding HTML versions may not yet be available. Always check the lists of Acts and SIs on the Acts and SIs home pages. If the hyperlinked version of an Act or an SI is not live (not a link), then it is not searchable on the eISB. Níl ach leaganacha hipearnaisc (leaganacha HTML) den reachtaíocht inchuardaithe ó leathanach cuardaigh thapa agus cuardaigh chasta an eISB. Cé go bhfoilsítear leaganacha PDF de IRí agus Achtanna ar an eISB chomh tapa agus is féidir, seans nach mbeidh fáil ar leaganacha HTML go fóill. Seiceáil liostaí na nAchtanna agus IRí ar leathanaigh baile na nAchtanna agus IRí i gcónaí. Mura bhfuil leagan hipearnaisc Achta nó IR beo (le nasc), níl sé inchuardaithe ar an eISB mar sin. What is the default search on the eISB? Cad é an cuardach réamhshocruithe ar an eISB? Exact word search is the default search on the eISB. For example, a search for the term child retrieves documents which contain that exact term only - documents which contain for example, the term children will not be retrieved. AND is the default search operator. 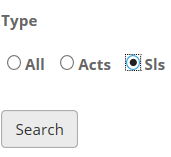 If you do not use AND, OR or NOT to connect your search terms, the eISB search engine defaults to an AND search. For example, a search for pension spouse = pension AND spouse. Is é cuardach focail bheacht an cuardach réamhshocruithe ar an eISB. Mar shampla, aisghabhann cuardach don téarma leanbh doiciméid leis an téarma beacht sin amháin - ní aisghabhfar doiciméid leis an téarma leanaí, mar shampla. Is é AGUS an t-oibreoir cuardaigh réamhshocruithe. Mura n-úsáideann tú AGUS, NÓ ná NÍ chun do théarmaí cuardaigh a nascadh, déanann inneall cuardaigh an eISB cuardach AGUS de réir réamhshocruithe. Mar shampla, cuardach i gcomhair pinsean céile = pinsean AGUS céile. How do I combine my search terms using AND, OR or NOT (Boolean Operators)? Conas a chuirim mo théarmaí cuardaigh le chéile trí AGUS, NÓ nó NÍ (Oibreoirí Boole) a úsáid? You must use capital letters for AND, OR and NOT. AND : To find documents that contain all the terms you enter, separate the terms with AND. OR : To find documents that contain any of the terms you enter, separate the terms with OR. Use Brackets if you are combining AND, OR or NOT in a search query. This orders the search query logically. Terms in brackets are processed first. For example, the following search will find documents which contain either oil or gas, and they must also contain the term convention. (oil OR gas) AND convention Caithfear ceannlitreacha a úsáid i gcomhair AGUS, NÓ agus NÍ. AGUS : Chun doiciméid a aimsiú ina bhfuil gach téarma a chuireann tú isteach, roinn na téarmaí le AND. NÓ : Chun doiciméid a aimsiú ina bhfuil aon téarma a chuireann tú isteach, roinn na téarmaí le NÓ. Bain úsáid as Lúibíní má tá tú ag cur AGUS, NÓ nó NÍ le chéile i gcuardach. Cuireann seo ord loighciúil ar chuardach. Próiseáiltear téarmaí i lúibíní ar dtús. Mar shampla, aimseoidh an cuardach seo a leanas doiciméid le ola nó gás, ach caithfidh siad an téarma coinbhinsiún a áireamh freisin. How do I search for an exact phrase? Conas a dhéanaim cuardach i gcomhair frása beacht? Use double quotation marks to find an exact phrase. "income tax" OR "corporation tax"
Please note that neither the * symbol nor the ? symbol (truncation and wildcard) are effective within double quotation marks. Bain úsáid as comharthaí dúbailte athfhriotail i gcomhair frása beacht. "an biúró um shócmhainní coiriúla"
"cáin ioncaim" NÓ "cáin chorparáide"
Tabhair faoi deara le do thoil nach bhfuil éifeacht ag an tsiombail * ná an tsiombail ? (teascadh agus saoróg) laistigh de chomharthaí dúbailte athfhriotail. Can I use wildcard and truncation operators? An féidir liom na hoibreoirí saoróige agus teasctha a úsáid? Use the * symbol at the root of a word to find word variants. Finds rail, railway, railways, railroad, railroads etc. Use the * symbol at the end of a word to find regular plurals. Use the * symbol to represent a number of characters within a word. Please note that the * symbol will only find letters within a word or at the end of a word. For example, a search for solicitor* will find solicitors but will not find solicitor's (because an apostrophe is not a letter). The wildcard ? symbol represents a single character within a word. This is useful for words which may have an accented character, for example a fada or variant spelling. Bain úsáid as an tsiombail * ag fréamh focail le teacht ar mhalairtí focail. Aimsíonn seo iarnród, iarnróid, bóthar iarainn, bóithre iarainn srl. Bain úsáid as an tsiombail * ag deireadh focail le teacht ar iolraí rialta. Bain úsáid as an tsiombail * chun roinnt litreacha laistigh d’fhocal a léiriú. Déanann siombail na saoróige ? ionadaíocht do litir aonair laistigh d’fhocal. Tá sé seo úsáideach d’fhocail a bhfuil litir aiceanta acu, mar shampla síneadh fada nó litriú eile. Tabhair faoi deara le do thoil nach bhfuil éifeacht ag an tsiombail teasctha * ná an tsiombail saoróige ? laistigh de chomharthaí dúbailte athfhriotail ná ag tús focail. Níl an tsiombail saoróige ? éifeachtach ag deireadh focail. How do I search for a word containing a fada? Conas a chuardaím focal le síneadh fada? Please note that neither the truncation * symbol nor the wildcard ? symbol are effective within double quotation marks or at the start of a word. Please note that the wildcard ? symbol is not effective within double quotation marks or at the start or end of a word. Tabhair faoi deara le do thoil nach bhfuil éifeacht ag an tsiombail teasctha * ná an tsiombail saoróige ? laistigh de chomharthaí dúbailte athfhriotail ná ag tús focail. Tabhair faoi deara le do thoil nach bhfuil éifeacht ag an tsiombail saoróige ? laistigh de chomharthaí dúbailte athfhriotail ná ag tús ná críoch focail. How do I search for a number of terms in proximity to each other? Conas a chuardaím roinnt téarmaí atá gar dá chéile? You can carry out a search for 2 or 3 words only, in proximity to each other. Enter the terms in double quotation marks, followed by the @ symbol, followed by the desired number of words. Finds documents which contain both the terms insurance and cover, but only if they are within 5 words of each other. Finds documents which contain all three terms insurance, cover and contract, but only if they are within 8 words of each other. D’fhéadfá cuardach a dhéanamh i gcomhair 2 nó 3 fhocal atá gar dá chéile. Cuir na téarmaí i gcomharthaí dúbailte athfhriotail, leis an tsiombail @ ina ndiaidh, agus an líon inmhianaithe focal ina ndiaidh. Aimsíonn seo doiciméid ina bhfuil na téarmaí árachas agus cumhdach, ach caithfidh siad a bheith laistigh de 5 fhocal óna chéile. Aimsíonn seo doiciméid ina bhfuil na téarmaí árachas, cumhdach agus conradh, ach caithfidh siad a bheith laistigh de 8 bhfocal óna chéile. Can I search within my search results? An féidir liom mo thorthaí cuardaigh a chuardach? Yes. On the search results page you will see the box below. Enter your search terms in the 'Search within Results' box and click on the magnifying glass. If your original search was a title only search, then your search within results will also be a title only search; if your original search was a title and text search, your search within results will also be a title and text search. Is féidir. Feicfidh tú an bosca thíos ar an leathanach torthaí cuardaigh. Cuir isteach do théarmaí cuardaigh sa bhosca “Cuardach laistigh de na Torthaí” agus cliceáil ar an ngloine formhéadúcháin. Can I limit my search by date? An féidir liom mo chuardach a theorannú de réir dáta? 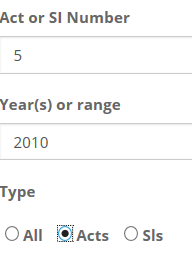 Example 1: limit search by year or years Sampla 1: Teorannaigh cuardach de réir bliana nó blianta. This will limit your search to the years 1999, 2000 or 2010 only. Teorannófar seo do chuardach do na blianta 1999, 2000 nó 2010 amháin. Example 2: limit search by date range Sampla 2: Teorannaigh an cuardach de réir raon dáta. This will limit your search to the years 1998, 1999, and within the range 2000 to 2015 only. Teorannófar seo do chuardach do na blianta 1998, 1999, agus laistigh den raon 2000 go 2015 amháin. Can I limit my search by Act or SI? An féidir liom mo chuardach a theorannú de réir Achta nó IR? 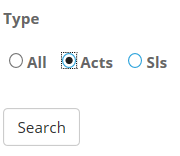 In the quick search which is available on each page, use the drop down arrow to choose Acts or SIs. The default search is All Legislation. Sa chuardach tapa teidil atá ar fáil ar gach leathanach, bain úsáid as an saighead anuas chun Achtanna nó IRí a roghnú. Is é an cuardach réamhshocruithe ná Reachtaíocht Uile. Athraigh é seo go Acht nó IR chun do chuardach a theorannú. Change this to Act or SI to limit your search. The advanced search screen also defaults to searching ALL legislation. Use the radio buttons to select either Acts or SIs. Déanann an scáileán cuardach casta cuardach réamhshocruithe do Reachtaíocht Uile freisin. Bain úsáid as na cnaipí raidió chun Achtanna nó IRí a roghnú. Can I search for terms within a specific Act or SI? An féidir liom téarmaí a chuardach laistigh d’Acht nó IR ar leith? aimsíonn an cuardach thíos an focal díolúine in Acht uimhir a 5 de 2010 amháin. Can I search by subject area? An féidir liom cuardach a dhéanamh de réir réimse ábhair? There is no subject term search in the eISB. However, the eISB contains a link to the Law Reform Commission's Classified List of Legislation. Níl aon chuardach téarma ábhair san eISB. Tá nasc ag an eISB leis an Liosta Rangaithe Reachtaíochta de chuid an Choimisiúin um Athchóiriú an Dlí, áfach. The user performs a search on the eISB and the search software produces a set of results. When a result (eISB web page) is displayed, the words from the search are passed to the browser's own page search and it is the browser that displays the highlighting. Thus while the eISB search itself can be quite complex there are limitations on what the browser's own highlighting will display. Users therefore should not rely on the highlighting of search terms, as highlighting is not always effective, in particular in complex searches. An exact phrase search is carried out on the eISB by enclosing the phrase in double quotation marks. The highlighter in the browser generally works for an eISB exact phrase search. However there can be differences between what the browser and the eISB deem an exact phrase, for example in the case below the difference is due to punctuation. Although this will be retrieved in an eISB search, the phrase will not be highlighted in the browser. This is because of the additional double quotation marks around the word "guardian" in the text. So for the browser the phrase guardian means is not the same as "guardian" means. The above also applies to dashes, brackets, commas, semi-colons and other punctuation. The eISB search engine can work out how close words are to each other and produce a proximity search. However the browser's in-page highlighting has no proximity capability. None of the proximity search terms will be highlighted in the browser. Therefore highlighting does not support proximity searching. Entering more than one search term into the eISB with no quotes or Boolean operators etc. If you enter more than one search term into the search box without entering AND, OR, NOT (e.g. protected disclosures), or enclosing the terms in double quotation marks, the eISB automatically puts an AND between your terms. However in this case the browser takes this type of search to be a phrase search – if the terms appear as a phrase on the page then the browser highlights the phrase. Individual occurrences of the words are not highlighted. The eISB search engine can find base words and by using the * symbol can also find word variants and some plurals. For example a search for rail* will find rails, railway, railings etc. The browser's highlighter does have the ability to highlight the entire words so it will highlight rail, rails, railway, but it will also highlight words it should not such as trail. This is a feature of the browser and not from the eISB search. When within a word, eg. c*t, the eISB search engine will find all words beginning and ending with the letters specified. In this example cat, cut, commencement etc. The browser highlighting does not support this type of search using the * symbol. The browser does not recognise the * in the middle of a word. In the example above the browser will highlight occurrences of 'ct' (appearing beside each other) anywhere in a word. When using the ? symbol for a single character wildcard, for example organi?ation, the eISB search will find organisation and organization. The browser highlighter does not work for this search and neither word will be highlighted. Therefore highlighting does not support the single wildcard. Déanann an t-úsáideoir cuardach ar eISB agus gintear liosta torthaí ag na bogearraí cuardaigh. Nuair a léirítear toradh (leathanach eISB), cuirtear na focail ar aghaidh chuig cuardach leathanaigh an bhrabhsálaí féin agus is é an brabhsálaí a léiríonn an t-aibhsiú. Mar sin, cé go bhfuil cuardach an eISB réasúnta casta, tá teorainneacha ar an méid is atá aibhsiú an bhrabhsálaí féin in ann a léiriú. Níor chóir d’úsáideoirí brath ar aibhsiú na dtéarmaí cuardaigh, mar sin, toisc nach mbíonn an t-aibhsiú éifeachtach i gcónaí, go háirithe le cuardaigh chasta. Déantar cuardach frása beacht ar an eISB tríd an bhfrása a chur i gcomharthaí dúbailte athfhriotail. Go ginearálta, oibríonn an t-aibhsiú sa bhrabhsálaí i gcomhair cuardach frása beacht eISB. Is féidir difríochtaí a bheith ann idir cad a mheasann an brabhsálaí agus an eISB gur frása beacht ann, áfach. Mar shampla, sa chás thíos baineann an difríocht le poncaíocht. Cé go n-aisghabhfar é seo le cuardach eISB, ní aibhseofar an frása sa bhrabhsálaí. An chúis leis seo ná na comharthaí dúbailte athfhriotail atá ar an bhfocal “caomhnóir” sa téacs. Don bhrabhsálaí, mar sin, ní hionann an frása ciallaíonn caomhnóir agus ciallaíonn "caomhnóir". The above also applies to dashes, brackets, commas, semi-colons and other punctuation. Is féidir le hinneall cuardaigh an eISB gaireacht na bhfocal dá chéile a dhéanamh amach chun cuardach gaireachta a fháil. Níl acmhainn ghaireachta ag aibhsiú leathanaigh istigh an bhrabhsálaí, áfach. Ní aibhseofar aon cheann de na téarmaí cuardaigh ghaireachta sa bhrabhsálaí. Ní thacaíonn aibhsiú le cuardach gaireachta mar sin. Níos mó ná téarma cuardaigh amháin a chur isteach san eISB gan comharthaí athfhriotail ná oibreoirí Boole srl. Má chuireann tú níos mó ná téarma cuardaigh amháin isteach sa bhosca cuardaigh gan AGUS, NÓ, NÍ (m.sh. nochtuithe cosanta) a iontráil, nó na téarmaí a chur i gcomharthaí dúbailte athfhriotail, cuireann an eISB AGUS idir na téarmaí go huathoibríoch. Sa chás seo, áfach, glacann an brabhsálaí leis gur cuardach frása é – má léirítear na téarmaí mar fhrása ar an leathanach, aibhsíonn an brabhsálaí an téarma mar sin. Ní aibhsítear tarluithe aonair de na focail. Is féidir le hinneall cuardaigh an eISB bunfhocail a aimsiú agus, tríd an tsiombail * a úsáid, is féidir leis malairtí focail agus roinnt iolraí a aimsiú freisin. Mar shampla, aimseoidh cuardach i gcomhair ráth, rátha, agus ráthanna freisin. Tá sé d’acmhainn ag aibhsiú an bhrabhsálaí na focail iomlána a aibhsiú agus, mar sin, aibhseoidh sé ráth, rátha, ráthanna, ach aibhseoidh sé focail nár chóir dó freisin ar nós tráth. Is gné é seo den bhrabhsálaí agus ní den chuardach eISB. Nuair a chuirtear laistigh d’fhocal é, m.sh. c*t, aimseoidh inneall cuardaigh an eISB gach focal a thosaíonn agus a chríochnaíonn leis na litreacha a shonraítear. Sa sampla seo, cat, ceart, cóipcheart srl. Ní thacaíonn aibhsiú an bhrabhsálaí leis an gcineál seo cuardaigh leis an tsiombail *. Ní aithníonn an brabhsálaí an * i lár focail. Sa sampla thuas, aibhseoidh an brabhsálaí tarluithe an ‘ct’ (in aice dá chéile) aon áit i bhfocal. Agus an tsiombail ? á úsáid agat i gcomhair saoróg carachtair aonair, mar shampla g?s, aimseoidh cuardach an eISB gás agus gas. Ní oibríonn aibhsiú an bhrabhsálaí i gcomhair an chuardaigh seo agus ní aibhseofar ceachtar focal. Ní thacaíonn aibhsiú le cuardach gaireachta mar sin. How can I get help with the site? Conas is féidir liom cabhair a fháil leis an suíomh? A technical helpdesk service is available for the Irish Statute Book. Neither the Office of the Attorney General or the helpdesk provide assistance with interpretative queries on legislation, matters relating to the updating of content or the issuing of new content. Please do not call with interpretive questions on individual pieces of legislation, as unfortunately, these cannot be answered. Such queries are best directed to the Department or body that created the Act or Statutory Instrument in question. The helpdesk telephone number is or e-mail isb@propylon.com. Tá seirbhís deasc chabhrach teicniúla ar fáil do Leabhar Reachtanna na hÉireann. NÍ chuireann Oifig an Ard-Aighne ná an deasc chabhrach cabhair ar fáil do cheisteanna léirmhínitheacha faoin reachtaíocht ná faoi chúrsaí a bhaineann le nuashonrú ábhar ná le heisiúint d’ábhar nua. Ná glaoigh orainn le ceisteanna léirmhínitheacha faoi phíosaí aonair reachtaíochta, mar, faraor, ní féidir iad sin a fhreagairt. Is fearr ceisteanna dá leithéid a chur ar an Roinn nó ar an gcomhlacht a chruthaigh an tAcht nó Ionstraim Reachtúil atá i gceist. Is í uimhir theileafóin na deisce cabhraí ná nó ríomhphost isb@propylon.com. Who can I contact for legal advice or help understanding a particular legislation item? Cé is féidir liom dul i dteagmháil leo i gcomhair comhairle dlí nó cabhair chun mír reachtaíochta ar leith a thuiscint? ’fhéidir go mbeidh comhairle ghairmiúil dlí uait. How can I give feedback on the eISB? Conas is féidir liom aiseolas a thabhairt ar an eISB? You can fill out our feedback form. FAQ version as at 2019-04-04 Is féidir leat ár bhfoirm aiseolais a líonadh.